From Mediaite: The Vice Presidential debate is tonight — what can viewers look forward to? 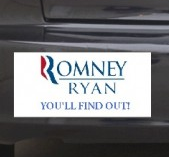 How about Republian VP Candidate Paul Ryan’s stance on abortion? Reports Mediaite, “On Tuesday, Republican presidential candidate Mitt Romney threw another twist into the Silly Straw™ that is his position on reproductive rights, telling The Des Moines Register that if elected, he would not pursue legislation . His campaign immediately back-tracked, as did Romney a few hours later, but the whole brouhaha caused running mate Paul Ryan to make one of the most bizarre political declarations ever. After insisting (wrongly) that he and Romney have a position on abortion that’s ‘consistent and hasn’t changed,’ a reporter asked him what that position is. There are things that politicians say which should make voters question whether that person is qualified to hold scissors, let alone public office… and Ryan’s response to that reporter is one of them: ‘You’ll find — you’ll — I’m sure you’ll find out in these debates. '” Read more here. From Gossip Cop: The family of late Whitney Houston is not without drama, and now it’s going to be chronicled in a reality TV series. Even just the preview promises high drama, writes Gossip Cop: “Bobbi Kristina Brown says she is engaged to her adopted brother Nick Gordon in a preview clip for ‘The Houstons: On Our Own,’ the new reality show about the late Whitney Houston’s family. ‘We’re engaged,’ announces the 19-year-old during a meal with stunned relatives. The revelation can be seen in a special E! sneak peek at the series. And the drama doesn’t end there. In the extended teaser below, the Houston family can be seen grappling with a host of other issues as they grieve Whitney’s death and focus on Bobbi Kristina’s future. ‘The Houstons: On Our Own’ premieres on Lifetime on October 24.” Will you watch? Read the article (and watch video of this announcement) here. From Geekosystem: Well, this doesn’t look good for Apple, who have already come under fire for their factory conditions. Reports Geekosystem, “Is there any other way than ‘evil’ to describe a company pressuring one of their employees, that had almost half their brain removed after a work-related accident, to leave the hospital? Thought not. That’s what Foxconn — Apple’s largest contract manufacturer — is doing, though. 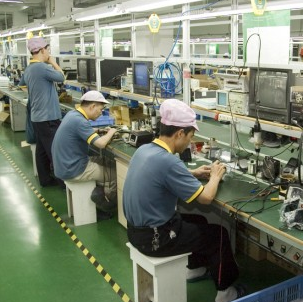 Zhang Tingzhen, one of Foxconn’s employees, was left unable to speak or walk correctly after doctors surgically removed parts of his brain following an electric shock received at the factory. Unfortunately, it appears Foxconn is tired of footing the bill. See, the law requires disabled employees to be assessed by a panel of medical experts in order for compensation to be given. Contrary to what Foxconn has been pressuring, however, this assessment is typically done after treatment is concluded. Zhang remains under observation for the time being, so his treatment is obviously not over.” Read the story here. From Styleite: What do fashionistas/Vogue readers have to look forward to this autumn/winter? 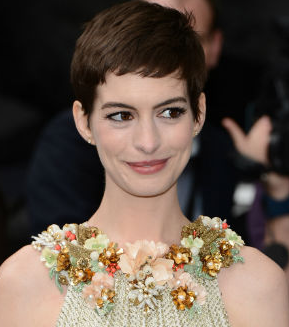 Apparently, Anne Hathaway and Rihanna photographed by legendary Annie Liebovitz! Reports Styleite, “Last month at Annie Leibowitz‘s art show in Ohio, a fan asked the legend if she was photographing any magazine covers. Instead of giving a cookie cutter response or not answering all together, Leibowitz dropped the bomb on not one, but two major Vogue covers. In a video taken by a fan post-show while Leibowitz was handing out autographs, the photog revealed that she shot Rihanna and Anne Hathaway for back-to-back Vogue covers. Of course, we already knew about Rihanna’s cover ever since she tweeted (and deleted) about her Vogue photoshoot. Leibowitz didn’t spill any more deets, but Fashionista speculates that Rihanna will score a November cover since her album is due out that month, and that Hathaway will nab December because the remake of Les Miserables is hitting theaters then.” Read on here. From SportsGrid: If you watched the Yankees/Orioles game last night, you know there’s one name everyone’s talking about: Raul Ibanez. 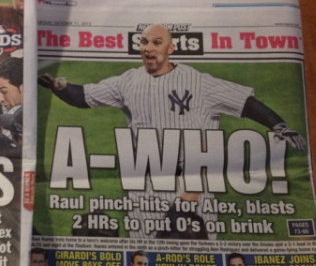 Writes Sportsgrid, “Boy, what a night for Raul Ibanez, huh? Comes in as a pinch-hitter [for Alex Rodriguez] in the ninth inning with the Yankees on the verge of going down 2-1 to the Orioles, hits a game-tying home run, comes up again in the 12th, promptly hits a game-winning home run? That must have been all anyone could talk about, what a storybook night it was for Ibanez, coming out of nowhere to be a big playoff hero.” But the problem? 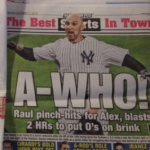 New York headlines, who focused more on A-Rod’s failure than Ibanez’s success, saying “A-WHO!” and “Who Needs A-Rod?” SportsGrid’s Glenn Davis thinks it wouldn’t have killed the papers to focus on Ibanez’s fairy tale story (Yankees fan turned 40-year-old playoff star). Read his opinion here. From The Mary Sue: Casting rumors! Casting rumors! This time involving not The Hunger Games but The Amazing Spider-Man 2. Writes The Mary Sue, “If you were one of those fans happy Mary Jane Watson was left out of the Spider-Man reboot, I’m sorry, she’s back. 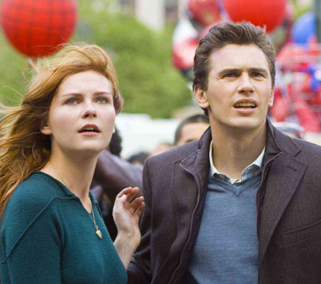 The Amazing Spider-Man 2 is looking to cast both Mary Jane and Harry Osborn. One actress is already up for the role plus, we’ve got some rumors on who the villain might be! 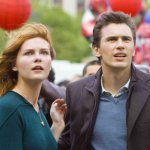 So it seems Gwen Stacy might have some competition for Peter Parker’s heart in The Amazing Spider-Man 2. Variety is reporting not only will Mary Jane be in the film but actress Shailene Woodley is already being considered for the role. You may know her from The O.C. or The Secret Life of the American Teenager. No word yet on who might play Harry.” Read more and stay updated here. From The Jane Dough: Some of you may have been watching baseball or Modern Family last night, but The Jane Dough was watching the pilot of Nashville, and editor Sarah Devlin is sharing her thoughts on it: “I’ve been looking forward to the Nashville premiere for weeks: it’s a major network show helmed by a woman (Callie Khouri, who wrote Thelma and Louise, for heaven’s sake) starring one of my favorite actresses, Connie Britton, and featuring a fictionalized Faith Hill/Taylor Swift female country star rivalry. What’s not to love? The pilot, which premiered last night (but has been online for about a week) did not disappoint… I’m not a huge country music fan, but I am a huge modern soap opera fan and Nashville is delivering so far. It’s stylish, filled with enough conflict to power several seasons, and Connie Britton is crushing it… I’ll be watching.” Read the rest of her thoughts here. 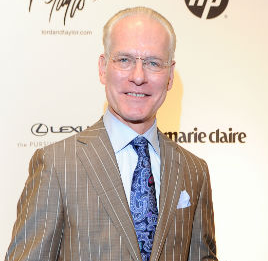 From The Braiser: Celeb chefs are banding together with Project Runway’s Tim Gunn. Why? Marriage equality! 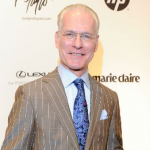 Writes The Braiser, “On October 24th, celebrity chefs including Jose Andres and Bryan Voltaggio will converge at Chefs for Equality, an event emceed by Tim Gunn and co-hosted by the Human Rights Campaign and food columnistDavid Hagedorn. At the Ritz Carlton Washington DC, they’ll joinMaryland Gov. Martin O’Malley (D) in an effort to preserve Maryland’s standing marriage equality law, which is up for referendum next month. Tickets are going for $300 a head, but if you want to feel like you’re at one of those fancy Obama dinners, you can bid on one of nine auctioned chefs tables, where celebrity chef duos will be teaming up to cook you a five-course meal. Bryan “The Quiet One” Voltaggio is paired with Michel Richard of Central, and this event solves the mystery of his offering to match donations made to Marylanders for Marriage Equality. Sommeliers will also be on hand to craft wine pairings on the fly.” Read more here.